The royal city of Amarna was a relatively ‘new’ settlement if viewed from the perspective of Ancient Egyptian history. Built almost 1,200 years after the Great Pyramid (circa 1346 BC), the entire city was actually constructed on a virgin site, on the orders of the Pharaoh Amenhotep IV – who was later known as Akhenaten. And while this urban scope was situated almost midway between Cairo (Giza) and Luxor, on the east bank of the Nile River (presently in the Egyptian province of Minya), the city both inspired and instigated various sections of the Egyptian elite – since it was dedicated to Aten, a solar deity who was proclaimed by the Pharaoh to be above the other Egyptian gods. In essence, Akhenaten declared a monotheistic (or possibly henotheistic) mode of religious affiliation across all of Egypt, with the worship centered around Aten. Such a radical promulgation had deep reaching effects in the Egyptian society, and ultimately resulted in counter-implementations of the traditional pantheon system – with the legacy of Akhenaten being intentionally wiped out by his successors after the defiant pharaoh’s death. But while Akhenaten was ‘officially’ discredited after his lifetime, his successors and the later dynasties couldn’t impeccably destroy his heritage. That is because, much like his radical thoughts on the Egyptian pantheon, the city of Amarna boasted revolutionary architecture. For example, most of the temples were constructed without any roofing, thus symbolically allowing the unobstructed passage of the effulgent rays of the solar deity on the worshipers inside. But even more importantly, many of these monumental structures were built with the use of standardized stone bricks known as Talatats (as opposed to the unwieldy huge blocks of stone). So while the city of Amarna was physically razed from face of the earth by the later ‘traditionalists’, its interesting architectural features have caught the attention of historians and archaeologists – thus unintentionally preserving the legacy of Akhenaten. 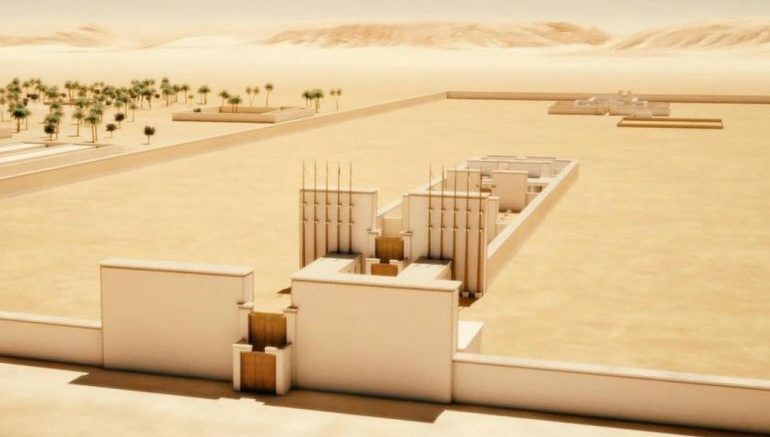 To that end, the experts over at Archéovision have digitally reconstructed the royal city of Amarna with incredibly detailed 3D rendering techniques. Under Akhenaten, temple iconography changed drastically. Until this point, it mainly showed scenes of the pharaoh and a divinity in a variety of religious situations. In the worship of Aten, the sun disk, the pharaoh gradually morphed into this single god and scenes of his own everyday life started to be represented on the walls of temples. In any case, the ambitious project in itself still has a long to go, especially since there are around 10,000 excavated Talatats waiting to be ‘put together’ from the Karnak foundations. And part of this huge endeavor might just be helped by a current crowdsourced platform that directly involves the public. For more information, take a gander at Aton-Num.